existing Westbury Blue Circle Sports Field which included: the Social Club House, a cricket square & football pitch. 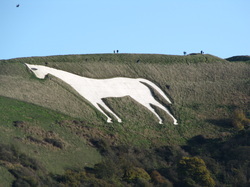 The land is formed on Kimmeridge clay “reserve raw material” and was owned by Blue Circle Cement for the production of Portland cement; it lies within site of the Westbury White Horse that enhances the views. The Cement Works Manager at that time had a positive response towards development of an additional sporting activity, provided works welfare members showed enough interest. They would be responsible for the development in their own time. A team of works’ employees formed a small committee 1973, this was a normal procedure for new activities and they reported to the welfare committee. The first task was to acquire skills required to design a course that would fit the boundaries of the land available and draw on experience within the volunteers to develop and start to build the course. After hoovering information visually from other courses and knowledge acquired by the team, progress started to build drainage and developing a green for Hole No.1 followed by a mower which was funded by the work’s welfare to shape out a fairway. The first stage was to have 3 or 4 Holes to practice on. Many Golf volunteers’ hours were spent progressing development of the land. The second stage 1975 produced a proposed layout for a regulation 9 holes course; tree planting laying drainage and pipe work to irrigate the developing Greens. proved suitable enough to enable the Club to participate in the Wessex League competing against 7 other Golf Clubs. To say that these people started to build the course we now have, using volunteers under the guidance of the committee was a great achievement. The course was later extended circa 1990 when land became available, thus increasing the length of the course and adding a water hazard. It is now a ‘Pay and Play’ course with membership for Golfers who have the option to play in competitive competitions. The current Men’s Course off the white tees is 2868 yards par35 OUT and 22816 yards par35 IN: Total 5684 par70. It includes 3par 5 holes. The Ladies Course is 2606 yards par35 OUT and 2530 yards par35 IN: Total 5136 par70. food - a vast improvement from a Cement work’s social club. A recent addition is a new Golf driving range available to all. Plans have been drawn up by Architect Adrian Stiff for an extension to 18 holes. Adrian has designed 12 courses in the West Country including: Cumberwell Park, Kendleshire, Oake Manor and Players Club Bristol.